Another delicious and healthy snack with the Avocado and Soya granules combo. 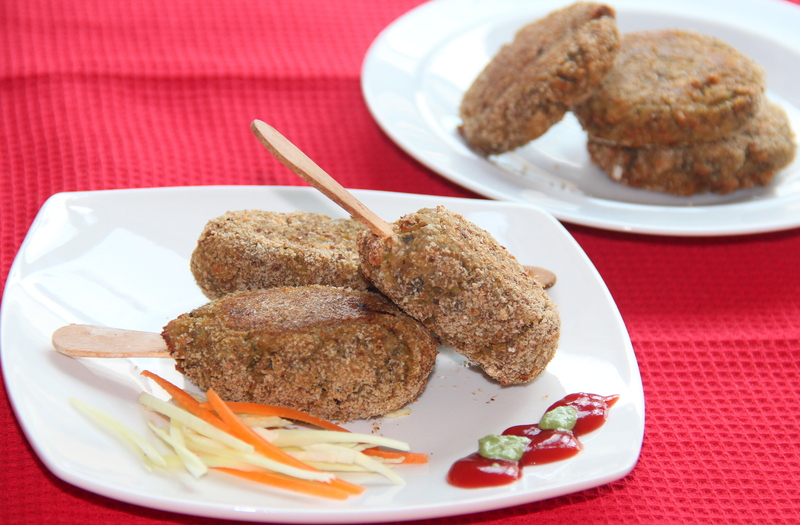 You can indulge in one more without much guilt as these are baked and not deep fried. A combination of protein-packed and fiber rich soya granules and avocado makes this a healthy snack for the weight-watchers menu. Normally we are used to have sweet lollipop, but here it’s a homemade spicy lollipop. Enjoy this appetizer. Bring enough water to boil in a sauce pan and cook soya for 10-15minutes, rinse 2-3times in cold water to get rid raw flavour of soya. Drain water completely and squeeze to remove excess water. Take the avocado and slice in half, remove the pit and peel each half, sprinkle some fresh lime juice over each half of avocado slice mash it. In a wide bowl combine mashed avocado, minced soya, onion, green chillies, garlic paste, mint, salt. Make small balls from this mix and shape them like an ice candy or lollipop inserting a stick into each. Do not worry if it is little sticky. Then dip the candies in corn flour-water mixture and again roll over bread crumb. Serve hot with ketchup/ salads. Soya chunks can be used instead of granules. Grated carrots and peas can also be included. Posted on July 28, 2014, in Appetizers, Indian, International, Starters, Vegan and tagged Avacado recipes, Chitras healthy kitchen, drchdietfood, Soya recipes, Spicy lollipops. Bookmark the permalink. 16 Comments. That’s so nice of you Sonal..
Another terrific-looking recipe, Chitra ! Soya granules/chunks, eh ? I must see if I can get them. It was quite tasty and healthy Margaret..
yum yum yumm, Chitra! So tasty looking! I would serve them as burgers! Ooh yes!